As the 2010-2011 'Salmon in the Classroom' process nears its end, it's a good time to reflect on the most recent stages of it, and spread awareness of it's popularity with Tayside's children. As I wrote a few months ago (see 'Salmon in the Classroom' article in the archive section to the right), the scheme centres around local schools taking a small number of eggs from the T.D.S.F.B. hatchery, keeping them in small refrigerators in the classroom, and then releasing them into a local burn (obviously ensuring that it is appropriate salmon habitat, and does not dry out in Summer months). Each class monitor the eggs to see when they hatch, and then can spend time looking at the salmon in the alevin stage. They learn about how yolk-sacs feed the juvenile fish for the first few weeks, and then as the fish reach the fry stage, the school take them out and release them. This normally takes place in late Spring. The next stage is probably the most exciting for the children. In May and June, one of our staff (myself these days) travels to each school along with the appropriate Council or National Park Ranger. Along with their teachers, we take the children down to the release site, and I explain to them exactly how electrofishing works. We then find a good vantage point for the children (normally a bridge if available) while I electrofish the stretch of burn. Obviously the idea is to find salmon, and the more life stages we find, the better. But ideally we want salmon fry, so that the children can see that 'their fish' are thriving. Invariably we also catch salmon parr, trout fry and parr, and on occasions other species such as sticklebacks, minnows, stone loach, and occasionally juvenile lamprey. If we are really lucky, we catch salmon parr as they are becoming smolts, and the group can see the 'silvering' process that occurs before the fish begin to head off to sea. There is so much to discuss with the children during these sessions, and they are full of questions. The fish are held in buckets for a short time so that everyone can see them close-up. And I try to use one black bucket and one white one, so that the children can see the colour change that the fish undergo in order to blend in to their background. There's always someone who comes up with the word 'camouflage'. In fact, I am often astounded at just how much the children have learnt, and how enthusiastic they are. Releasing the fish is always a popular moment, and I make the point that its very important that we are able to catch these fish, study them and then release them unharmed. We then carry out a 'kick sample' to collect invertebrates from the burn, and the children are provided with key-cards so that they can have a go at identifying what we find. 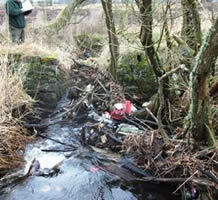 They learn that the invertebrate life in a burn is a fundamental factor in its success as a juvenile salmon nursery. I'm almost finished the electrofishing sessions with the seven schools we are working with this year. They will each produce a project on the entire process from start to finish, and these are judged by ourselves with the best school receiving a prize. The scheme goes from strength to strength, and more schools are contacting us each year to become involved. I just wish that when I was at school we had been given the chance to become involved in a similar scheme!! When it comes to salmon research, it's fair to say that 99% has taken place during the riverine period of the life-cycle. There are reasons for this, such as the work carried out by a global network of 'salmon-related bodies' whose jurisdiction runs as far as the sea but no further (such as District Salmon Fisheries Boards in Scotland). Population sampling of fry and parr through juvenile electrofishing surveys, radio-tagging and then studying subsequent upstream migrations of returning adults and marking stocked juveniles to study mortality rates of stocked fish are just some of the areas that have been investigated in great depth across a number of river systems (and indeed across various populations of Atlantic and Pacific salmon). There are also the obvious difficulties in studying salmon at sea, such as the sheer scale of the task. And yet it has become increasingly clear over the past decade or so that the overriding factors leading to the decline in salmon populations take place during the marine phase of the life-cycle. Other than a few disjointed marine surveys, the majority of what is known of salmon at sea has been taken from information provided by commercial high-seas fisheries. But no coordinated collaborative work on a large scale was ever undertaken. But for the last 5-6 years, an exciting new study on a scale never seen before has begun. The SALSEA (Salmon at Sea) programme is an initiative of NASCO (the North Atlantic Salmon Conservation Organisation), and was endorsed by the IASRB (International Atlantic Salmon Research Board) in June 2005. The collaboration includes representatives from a number of countries and organisations. And the work is vital in view of the fact that "The current period of low abundance of Atlantic salmon appears to be related to poor survival at sea. For some monitored stocks, marine mortality is currently twice as high as in the 1970s" (SALSEA Website). The IASRB's informative website can be viewed by clicking here. The programme aims to understand salmon migration patterns at sea and the reasons for salmon distribution across the North Atlantic, as well as to investigate aspects of salmon behaviour such as their use of ocean currents and food resources. The latest and, from a Tay perspective, most interesting part of the project is entitled 'SALSEA Merge'. It focuses on the North-East Atlantic, and involves Irish, Faroese and Norwegian research vessels, and these have been surveying through 2008 and 2009. Using the very latest genetic marker techniques, sampled salmon will be traced back to their river of origin, providing a migratory map of fish from various different river systems. Growth patterns will also be studied. Whilst there is much that can be done in Scotland by District Salmon Fisheries Boards to improve habitat, remove migratory obstructions and obtain a clear understanding of the issues facing salmon within each district, it is good to know that work is now being undertaken on a far larger scale at sea to try and begin to unravel the mysteries that surround this stage of the salmon's life. 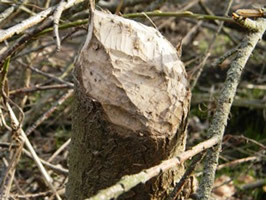 As many will already be aware, a number of unauthorised releases of beavers appear to have taken place in the district. The subject has hit the national news, with articles such as this one reaching the BBC website. It’s an emotive subject, and one in which a number of stakeholders have an interest. Scottish Natural Heritage has taken the lead in co-ordinating responses and action, and an interesting and informative article detailing the situation so far can be found on their website. They estimate between 7 and 20 animals are currently living in the district. The article details the reasons why these unauthorised releases are causing serious concern. 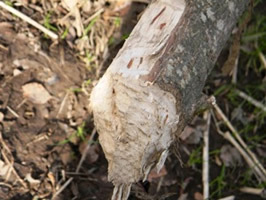 A well-publicised trial reintroduction of beavers is taking place in Knapdale Forest, Argyll. From a salmon fisheries board perspective, any unauthorised release of a non-native species (even if there is an argument that it may once have been native) is a concern. There has been some work in Canada regarding the impact dams built by beavers may have on the migration of salmon, and also the effect that dams can have on rivers in general. There is suggestion that dams could create impassable obstructions on smaller rivers and burns, potentially reducing salmon spawning habitat. Assessment of beaver-impacted rivers in Canada has also shown an increased build-up of fine sediment. Salmon redds require well-oxygenated water to flow through them, and fine particulates can inundate redds and prevent water from flowing through them. Indeed, sedimentation of instream habitats can render them useless for spawning, as the gravel required by salmonids to dig redds disappears. 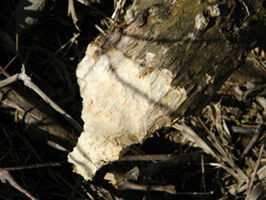 There are also other considerations, including the flooding of land that often results from beaver dams. SNH are carrying out a programme of trapping in the Tay catchment, and so it will be interesting to see what the results of this exercise are. Whatever the future holds for the Tayside beaver, one thing is clear. They are here, and are quite happy in their new environment. 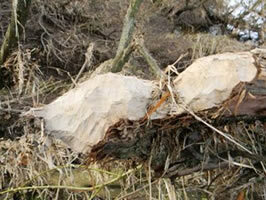 The pictures on the right were taken this week on the River Earn, and show significant and fresh tree damage. It’s the time of year when the ‘Salmon in the Classroom’ initiative gets going, and so it’s a good opportunity to give a little more detail as to what it involves. There can be no doubt that the future of wild salmon will be reliant on hard lobbying from the anglers and conservationists of the future, and therefore involving local schools in an interactive project provides children with a fascinating insight into the life-cycle of salmon whilst also gaining their interest at an early age. Scottish Natural Heritage (SNH) originally set the project up, but the Tay Foundation has now taken on the coordination of the project (although it is still funded by SNH). The project involves a number of stakeholders including National Parks, local councils and of course the T.D.S.F.B. 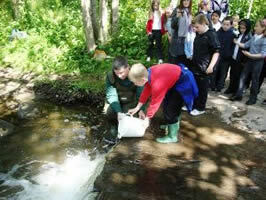 As its name suggests, the project aims to bring salmon into the classroom. At this time of year, our Almondbank hatchery is able to provide the schools involved with a small number of eyed-ova. These are then placed in fish tanks held in chiller cabinets within each classroom. The children are able to watch the development of the alevins inside the eggs, and then after they hatch the pupils can look after the developing juvenile salmon through the alevin stage to the point where the fry are ready to be released. 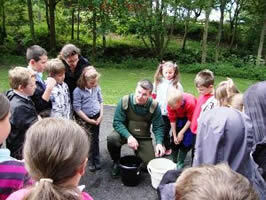 A session at a local burn will be arranged where the children can release the fry. Hatchery visits are arranged for each school so that the children can come to Almondbank and see the work that we undertake. Sessions on the life-cycle of salmon are included in these visits. A few months later (usually in mid-Summer), Tay Foundation staff will accompany the children back to the burn where the salmon were released. Using electro-fishing equipment, Tay Foundation staff capture fish in front of the children (hopefully including some of the fish they released). The children get a close-up view of any fish that are captured, and a bank-side lesson on different species and their developmental stages takes place before the fish are released again. The children produce project work based on the entire process, and often drawing and painting competitions take place. It really is a very rewarding experience for the children, and the scheme goes from strength to strength, with new schools looking to get involved each year. The area covered by the T.D.S.F.B. is the largest of any salmon fishery board in Scotland, and includes over 5,000 miles of rivers, lochs and burns. It's extremely important therefore to prioritise our work, and make sure that we get the greatest possible benefit from the projects we undertake. We have to be efficient. With this in mind, it is important that we classify rivers and burns into their relative importance in terms of habitat potential for salmonids. We can then focus on those burns that we can see require immediate attention, ensuring that time is not wasted on areas which are already in good shape or those in which improvement is not possible. The process involves some of our bailiff staff walking the burns and, using maps and recording sheets, noting down a wide range of information. Widths, depths, substrate, land-use, obstacles to migration (both natural and man-made), blockages and other factors are all recorded, and a series of photos are taken. When combined, this information enables us to build up a really good picture, calculating the quality of habitat in each burn and understanding the main issues that may be limiting fish production. Electrofishing surveys will also complement the work. A survey of the burns in the Eastern part of the catchment was commenced in 2010, and the subsequent report detailing the findings can be viewed here. There are still burns that are yet to be surveyed, and so we are continuing the process now. There really is no substitute for seeing these places first-hand, and there are sections of burns that we knew very little about until they were walked. The aim is to target specific areas for improvement, and also to produce fisheries management plans for each burn so that we can approach each one in a systematic manner. Talking to children about the colour change of fish in black and white buckets. Releasing the fish back into the burn. Photos above are published with kind permission of the school. 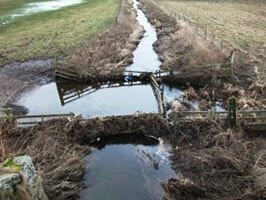 This cattle drink is positioned in such a way that it stops all upstream and downstream migration of fish. 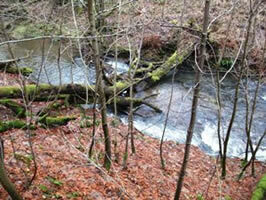 Here's a removable tree blockage in a remote area that hampers fish passage. 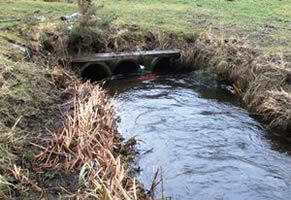 Culverts and pipe bridges are potentially bad news for fish migration. Their navigability is dependent on a number of factors, and they are liable to block-up. 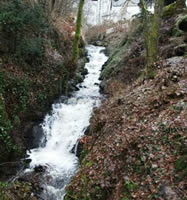 This series of falls may be impassable to salmon under various water conditions and temperatures throughout the year. 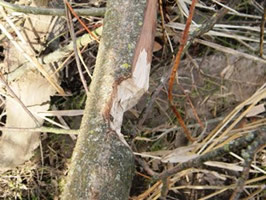 Debris blockages are easy to deal with, but without carrying out the survey we would not know they existed. It's an exciting time at the T.D.S.F.B. 's Almondbank hatchery, as the eggs collected from broodstock earlier in the close season reach the point at which they can be stocked out. Throughout the Winter, the fertilized eggs (ova) have been closely monitored in a temperature-controlled environment, to ensure that they do not develop too quickly. Artificially cooled water passes over the eggs 24 hours a day to slow their progress. This mimics the environmental factors they would face in the district's rivers during Winter. The last two Winters have been so cold that keeping the eggs at a constant optimum temperature in the hatchery has been easier than during mild warmer Winters. 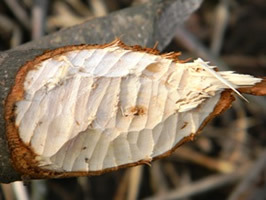 Throughout their time in the hatchery, ova which are inviable (clearly distinguishable from viable eggs) are removed on a daily basis to prevent the spread of fungus. The ova are now 'eyed'; an expression used to describe their appearance as the alevins form inside them. At this point a process known as 'shocking' takes place. They are removed from the trays and are agitated in such a way as to kill off any infertile ova, which are then removed once again. The eyed ova are now ready for the next stage, in which they are stocked out in the rivers and burns in which their parents were captured. It is important to ensure that they are thinly spread across their new habitat. Evidence shows that optimum fry survival occurs when densities are at around five fish per square metre. So, the next few weeks will involve stocking-out and before we know it the hatchery pumps will once again be turned off until next Winter. In the Summer of 2010 the T.D.S.F.B. applied to the Scottish Government for an experimental licence to trial shrimp fishing during July/August on a number of beats on the middle and lower Tay. The licence was granted for a three-year period, although it was to be operated under strict parameters (the main one being 100% catch-and-release). In 2010 the trial took place during August only. Detailed return forms were completed by each participating beat, and the resulting data was analysed. The T.D.S.F.B. discussed the trial at a recent board meeting, including the results of the data analysis and the merits of continuing it for the remaining two years that were granted under the licence. It has been agreed that the trial will not continue. It has become clear that shrimp fishing was not as popular with anglers as might have been expected (for a number of reasons), and this combined with favourable river conditions for all methods during the trial period led to a situation where it was difficult to see if the shrimp was more or less successful than any other method. Indeed, many of the beats that were included within the trial actually ended up fishing the shrimp rarely if at all. It would seem then that the relative benefits of the trial are not significant enough to justify its continuation. Therefore the shrimp will remain banned as a method throughout 2011 and beyond, just as it has been since 1999.